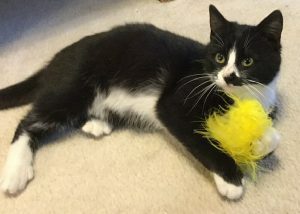 OSWEGO – Misty is a 6-month old, female, black and white tuxedo, short-haired cat. She is vaccinated, house-trained, indoor-only, and good with other animals and children. Misty is not yet spayed. Misty is friendly and loving. She’ll purr as soon as you pick her up. 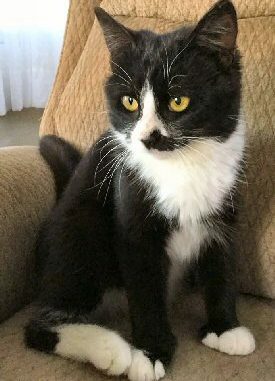 This smart little kitten has survived a harsh winter season living with her mommy outside for at least the first three months of her life. She has made a remarkable transition from outside to indoor kitty life. It appears she has wholeheartedly accepted this as she never tries to escape to the outside. She easily made friends with one of the cats where she currently stays. She was cautious at the beginning, but they quickly became friends. They run around chasing each other and bat and chase toys. She has a good appetite and seems to eat anything you give her. Misty is a very happy, active and healthy little kitty. Her adoption fee is $100 and includes up-to-date vaccinations. If you are interested in adopting Misty, you can download our adoption application from the Adopt A Pet page. You can email a completed app or any questions to [email protected]! The Oswego County Humane Society is designated under IRS code 501(c)3 as a charitable organization: 161586001 and registered with the New York State Charities.